Fruit cream gateaux is a fabulous and simple Kingsbury cake. Gift your loved ones with this tempting, unique and fabulous cake, from a place where `The Perfection is mastered`. Absolutely irresistible and deliciously baked fresh cakes from Kingsbury, is the best way to please and make your loved ones delightful on a memorable day. 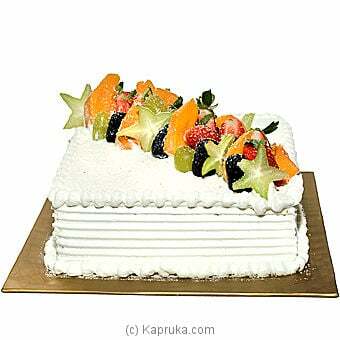 Kapruka in collaboration with Kingsbury offers you a variety of choice in gifting the best cakes for best prices.